friends & family over the holidays. & awesome start for TaskMitra. OMG!!!!!!!!!! We just got a call from Santa.. No Kidding. 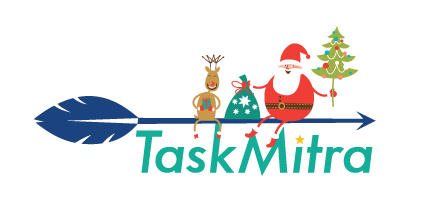 completed on TaskMitra.com from 1st Dec to 12th Dec.
By using TaskMitra this fortnight, you too can do your part. Chennai has been crippled by what authorities are describing as the worst rain in a century. The rains have left the city submerged and airport flooded. Train and bus services have also been brought to a halt by the incessant rains. Tamil Nadu’s worst and most relentless rainstorm in a 100 years is showing no signs of letting up. Life in capital Chennai ground to a complete halt as a fresh wave of rain lashed the city where 15 teams of the National Disaster Response Force have arrived. Help the city to cope with the fury of mother nature by sending in your donations. their support and contribution to Chennai. Want to Provide relief material to #ChennaiFloodsRelief ? At TaskMitra we believe that help is just a Mitra away. Our trusted league of Mitras have volunteered to pick up your contribution and bring it to us until the 15th of Dec! We have partnered with Goonj & other micro NGO’s in Chennai who will make sure your aid reaches its designated location. TaskMitra is proud to partner with The Eat India Company for an exceptional culinary experience know as “The Eat India Fest”. This winter for the first time we bring to Mumbai, its very own Family Food Festival! A diverse range of engaging activities for all age groups along with performances from reputed artists awaits us on 12th and 13th December 2015. Held at the iconic Mahalaxmi racecourse, a carnival by day and a fiesta by night, this event promises to be enchanting and entertaining for the whole family. A diverse list of specially selected food chains has been curated for this weekend. The list includes renowned food brands like Social, Moti Mahal Deluxe, Neel, Maroosh, The Baker’s Dozen, Magnum, Country of Origin, Belgian Waffle, Terttulia, WOW Popcorn, Baskin Robbins, Mamagoto, The Monkey Bar, MOD, Konkan Café, Fatty Bao, Jus Divine, The Bombay Food Truck and so on. Leading brands like OLA, Zomato, Himalayan, Natures Basket & Radio One are key partners for the event. To present the visitors with a feel of fine dine, live pop-up kitchens will be set by celebrity chefs including The Executive Chef from Impresario Hospitality- Gresham Fernandes, one of the top 10 young chefs in the country- Chef Jaydeep Mukherjee and Chef Mukhtar Qureshi hailing from the famous Qureshi family in Lucknow. Chef Rajeev of Trendz restaurant of the Lalit and Chef Floyd of Bombay canteen will also be showcasing their special preparations. There is also a special cheese making masterclass that is planned for the weekend. The event will also see a lineup of startups and home chefs like, Hakuna Batata, Yogisattva, Yummade, Namrata and Sapna Bajaj, Sweetish House Mafia, Frugurpop amongst others. While food is an integral part of this celebration, the organizers of the Eat India Co Food fest are leaving no stone unturned to make it a perfect weekend outing for the family. A line up of exciting activities for children is promised to keep them happily engaged. Guests will enjoy brands such as Camlin Kokuyo as the Art & Craft partner providing kids with access to unlimited crafting options. Cakesmith’s will bring marshmallow painting & other fun exercises. Millk offers a play area for kids with a café for parents to relax. Creative Imagination will conduct bookmark & dream catcher making workshops along with other gaming activities. Little Ustaads will expose children to Indian Classical music through instruments & rich vocals. Bookalicious by Lubaina Bandukwala, writer and host of the first literary fest for children in Hyderabad, will conduct a book reading session. Zeba Kohli’s chocolate making class will be a gateway to the Willy Wonka’s chocolate factory for kids. Go Bonkers, Mindsparks, Mr. Bookworm and so on are some of the other participants for the children’s section. Children under the age of 5 years will be given free entry to the festival. An exclusive area for senior citizens has been created, to ensure that they enjoy the ambience in comfort and soak in the experience. In the evening the guests can enjoy live music shows by popular bands like Astitva, Saxophonist Ryan Sadri, Singer/Songwriter/DJ/Actor -Manasi Scott and Mumbai-based award-winning artist Subhro Ganguly. Expect flash mobs, mind blowing performances by a Children’s band, Balloon Art, Jugglers, impromptu games, a Live Cooking theater, on ground Food Trails and much more surprises. The Eat India Company aims to make this festival a memorable event for the city and its people. It is a rare opportunity for people to get together with their loved ones in one open–air space, under the winter skies and rejoice. This one-of-a-kind initiative is all set to bring the food community from all over the country for every family to cherish and look forward to until next time. The significance of the first family festival is such that it is being appreciated by celebrities and renowned personalities from various fields.